Natalie Donaldson and her Friesian, Joy, disguised as a cowgirl and cow horse. Photo by Ginny Williams. One large public stable discovered how to combine Halloween fun with horses. Volunteers organized a parade for horses in costume and their riders and handlers. The colorful group was then sent trick-or-treating up and down the aisles of stalls and corrals. The grand finale was a judged costume class in the stable’s arena. Then everyone dished up a plate of food from a buffet of potluck offerings. 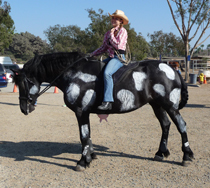 That’s how Halloween was celebrated on a recent Saturday afternoon at Huntington Central Park Equestrian Center in Orange County, California. It was hard to tell which riders and handlers were devotees of dressage, hunters, saddle seat, driving or western performance. They—and their horses—all arrived dressed as someone quite unlike their true identities. One black Friesian, for example, trick-or-treated incognito as a Cow Horse. She handed out goodies from the paddock occupied by her warmblood gelding, Oliver. Dekker noted that the party goers included kids on foot from the surrounding neighborhood. Since it was held during daytime hours, those non-horsey kids got a chance to pet a lot of docile equines, which helped encourage a good relationship with the local community. Indeed, everyone seemed to have a good time. If you’d like to organize a costumed trick-or-treat parade at your stable next year, here are a few suggestions. Begin by posting fliers at the barn several weeks ahead of time. That gives everyone a chance to plan their costumes. Next, ask the barn manager or stable owner to mail out notices to boarders at their home address. That ensures that everyone receives a notice so that no one feels left out. Then solicit freebie donations for the prizes from a nearby tack store. Or awards could be Halloween themed knick knacks from a discount store, purchased by pooling spare change. After all, Halloween on horseback is not about the prizes. The enjoyment comes from dressing up a favorite horse and gathering up a bunch of yummy treats. Next articleBaby Miniature Horse on the Loose! I am dressing up my horse, Tucker, as a paint horse, and I’m going as an indian. My friend is going as a cowboy + his horse. How fun! What a great idea, we will do this next year at our barn. Thank you for sharing this! Huntington Beach always has the best holiday events! I use to board @ HCPEC. I miss all my friends down there. Corrine ~ you ROCK GIRL!!! Wow! That sounds totally amazing. I was stumped at how you would pull that off at a boarding stable until I read that you have 420!! As far as I know we do not have such a large facility for boarding in Ontario. I’d love to see one some day.!! Have fun at future events. I love the ideas in the article. Hoof beat’s (saving horses one hoof a time) had a halloween contest on who could sketch the best coustume for our rescue horse Blaze! Whoever won got there costume made, and got the first picture whith blaze. I think that Halloween On Horseback is wonderful! game. I highly recommend it! Three cheers for Halloween on horseback! Hooray! I am going to figure out how to organize this at our stable next year. I think it’s a good idea to invite neighborhood kids who don’t own horses. It might help get them involved with horses and riding, too. Thanks for the idea! That sounds like a bunch of fun! That sounds amazing! I cant wait 2 tell my 4-H horse club all about this, so we could have one of our own! Thanks 4 the idea! Ps: What about giving our carrots as another little horsey treat 4 your 4 legged bff? I think it could work, as long as they dont eat mor than 1. Hey that sounds like a ton of fun!I will have to take that to our training barns this month and see what everybody thinks!